The hike to the falls is well worth it! Bridalveil Falls is one of the key elements of the signature view of Yosemite Valley that also includes El Capitan and Half Dome. For many park visitors it's their second stop in the park after the iconic tunnel view when first entering the valley. From the trailhead it's a short walk to the base of the falls and being paved, the going is easy, though there is one small slightly steep section to navigate. Turn right at the first intersection to head to the falls viewing area. Double back to the trailhead to complete the journey. Consider turning right at the intersection on the return leg of the journey instead of left to get another view of the falls from a distance. A stone bridge over the creek marks the spot to look to the right at the falls in the distance. The path beyond the bridge continues towards the main road where it joins up with the Valley Floor Loop. At that junction one is also rewarded with fine views of El Capitan. 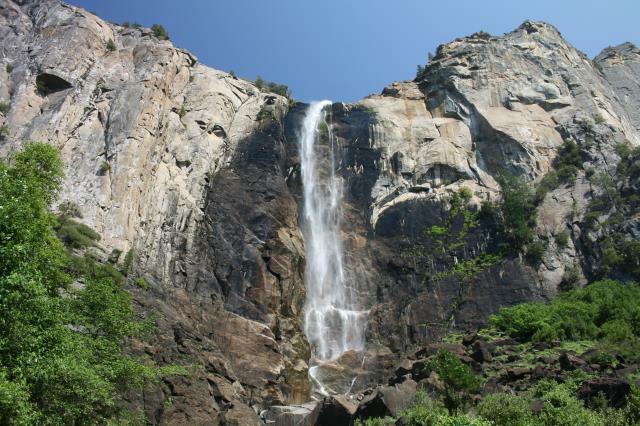 Plans are afoot to redo the trail to Bridalveil Falls that will turn the out and back path into a mini loop. Among other things, this should help relieve some of the congestion getting into and out of the falls viewing area. Coppertone and I decided to do a relatively flat hike on the valley floor today and the parking at the Bridalveil Falls trailhead looked like our best bet. Since we were here we might as well do this short hike to the falls, right? The trail is paved all the way to the base of the falls. There is one small steep section, but overall it's a very easy hike. The viewing area at the base of the falls has only one way in and out and it can get crowded. Even on a fall day with school in session it was a bit packed. I can't imagine the logjam in the heat of summer. Waterflow was low, but still a respectable amount crashed onto the rocks below. There are signs warning people of the dangers scrambling on the rocks to get closer to the water, which was ignored by many. In their defense though, the lower water flow meant no mist in the area to moisten the rocks so that they were even more dangerous. If you're going to pick a time of year to scramble, I guess now's the time. From the falls we followed the trails onto the valley floor proper to start our hike on the Valley Floor Loop. Bradalveil Fall is in the Yosemite Valley and is easy to get to. Highly recommended!